Repointing brick needed before water enters. Repointing brick or stone is not as simple as it sounds. Masonry repair work can not only damage but destroy old homes, unless you are an informed consumer and know what to ask. You the homeowner are responsible for protecting your home. Repointing brick or stone on OLD HOMES performed by most professional masons, or homeowners instructed by brick manufacturers on repointing brick, will result in the destruction of your house! Read on – this is extremely important. Let the buyer beware! Most of the best and well known masons out there may do a great job building a NEW brick wall, but you should use extreme caution when hiring them if you own an old home. When working with new brick, there is no problem, only the old brick and here’s why. 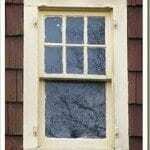 This pertains to homes build in the early 1900’s and earlier. Modern brick is fired differently and is therefore harder. Your home may have wood shingles, but don’t forget about chimneys and foundation walls constructed with brick or stone. As time passes, the masonry on old homes eventually needs repair. The mortar holding the bricks or stone deteriorates. Cracks then form, allowing water to enter. 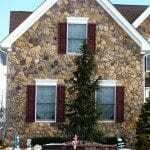 If neglected, the freeze and thaw cycle will cause the bricks or stone to fall out and hit you on the head. What do you do to prevent this? Repoint the mortar. Repointing brick or stone is a process where about 1 inch of mortar is removed and replaced with new mortar. This is a very common practice and all masons do this. The problem lies in their knowledge of what type of mortar to use. Using the wrong type will cause irreversible damage. Mortar used today is very strong and hard because it contains a large amount of Portland Cement. Portland Cement is good for certain applications, but it is not a fix-all as masons and building supply stores believe. Portland cement is not bad, it just must be used in the mortar mixture in a lower percentage when working with certain materials. 1. The important thing to know is the mortar MUST be softer (in compression strength) than the brick or stone it surrounds and have greater vapor permeability. 2. It must also be softer than the mortar it is replacing when repointing brick or stone. This is accomplished by using less Portland Cement and more Lime and Sand. 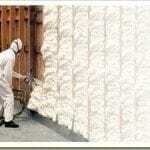 Moisture within a wall needs to escape and evaporate. 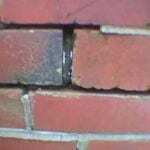 Mortar that is too hard will force the moisture to escape through the softer brick or stone. 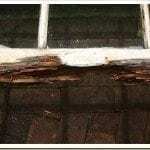 This will result in permanent damage such as cracking and spalling. 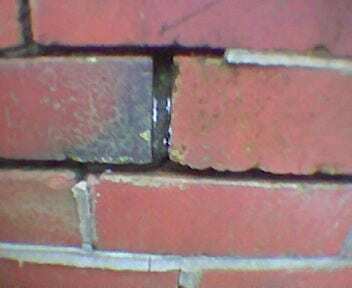 Repointing brick with strong hard mortar does not make a solid structure. Your brick is damaged beyond repair. This is a photo of damage caused to bricks from using the wrong type of mortar. The same problem occurs with stone. Mortar Types for repointing brick and stone. Mortar comes is types. Type M, S, N, O, K, and L.
Type M is the strongest and hardest and contains the highest percentage of Portland Cement while Type L has no Portland Cement and is the softest. Type O and Type K are recommended for most historic masonry applications. However, masons are not aware of this. When hiring a mason, ask them what type they would recommend and see what they say – that is the test. Play dumb at first. Forget about Home Depot type stores. I wanted to ask the pros in the concrete, block, and sand business that specialize in masonry work. I recently contacted Clayton Concrete Block & Sand (www.claytonco.com ) a very large company in NJ, and told them I had 150 year old brick that needed repointing. They recommended Type S. I played dumb and asked if it may be too hard for the old brick and asked if they carry Type O or K. I was told they are not familiar with those types!!! I then phoned a different office and Type N was recommended and again this sales person was not aware of the softer mortar types. If I depended on the pro’s in the business for information, and repointed my basement foundation, 10 years later I may not have a foundation. Let the Buyer Beware! Repointing brick with mortar harder than the brick. 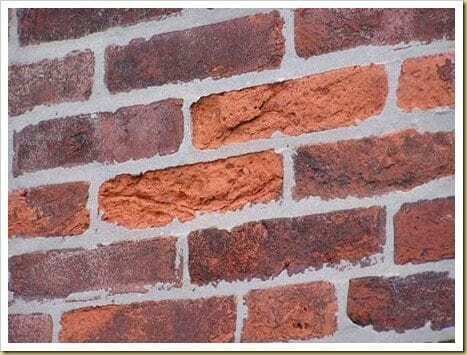 Moisture will escape through the softer brick damaging it while allowing only the mortar to remain. How do we make all Masons aware that using Portland cement is ruining our historical Masonry! This is as big of a problem as one can possibly be. We see all these historical society groups raising Hell about all different types of issues but nothing is said about the masons who go out into our cities everyday and open up a bag of Portland Mortar and start packing joints and ruining work that is over 100 years old. The question is how do we educate the Masons who don’t know anything about Restoration Masonry but call themselves Restoration Masons? “I consider myself to be a Great Mason and I have 28 years of laying Brick and just up to 3 weeks ago i had no idea about the damage that i could do to historical Masonry if I used Mortar that we use today on masonry that was done before 1933. If I would not be the type of person that reads up and researches things before i do something’ I could have done the same as all the Masons I see do and been using Portland Mortar also. I would love to take the credit but the site he references is the LinkedIn forum. Here is a link to a new blog post by Ward Hamilton written for Traditional Building magazine. Please share this information with your Facebook friends via the icon in the column. If you would like to be notified of articles such as this, please subscribe to this blog. Thanks for sharing. I had my bricks repointed a couple years ago and I have no idea if they used they right kind of mortar. I didn’t know about this back then. I guess I’ll find out if my bricks start falling apart. Actually, almost every mason may seem very knowledgeable about repairs. They wouldn’t be a mason for no reason. But thanks to this one, it is true that repairing old brick houses is a different thing. Unlike newer bricks that can be repaired in the simple and straightforward process. When it comes to old bricks, those older and more experienced masons have the advantage. They are more experience in older structures and have a better sense in choosing the right number of mortar for the old bricks. It is not that old time masons were more knowledgeable about using softer mortar for old bricks, but a modern understanding of how old and new products and methods react with each other over a period of time. 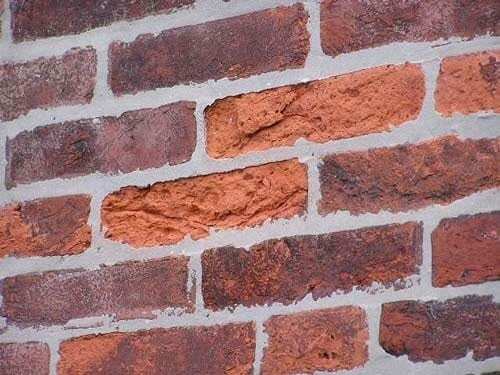 I know this is an older article but I have been doing extensive research on this topic and issue for our house which was built in early 1950’s which used a lime and sand mortar for the brick. It was constructed between 53′ and 54′ when the use of Portland cement was gaining success due to the rapid demand of new homes. Portland cement was added to the standard lime/sand mortar ratio because of the quick cure time that Portland could achieve and the fast turnaround time of laying the brick and block walls of the structure. Hence a new way for a construction company to gain more profit by completing construction faster and building more homes to meet demand, just like construction companies of today switching to quick prefab wooden structures with an outer brick facia usually not even covering all sides of the home, usually just the front wall now! Portland has been used since the late 1800’s but its popularity in America didn’t grown until after World War Two when what was left of our our troops returned home from war. Even though our home is not historic the type and strength of brick used was is still softer than the bricks of today which are manufactured for a high Portland cement mortar mix. I have found a very good company with a lot of information on this topic. They are located on the east coast and called Lancaster Limeworks of Pennsylvania. They have a nice website and they are able to take samples of your mortar and lead you in the right direction of what exactly was used in your mortar when it was mixed. They are very happy to take your phone calls as well. I’ve had to call them multiple times for help on our home projects. I hope this comment helps someone in the same situation. porch repointed 20 years ago not sure if the mortar is the right type but it seem to be ok and see no problems BUT THE COLOR IS HIDEOUS PLEASE TELL ME IF THERE IS SOMETHING THAT I CAN DO SHORT OF REPOINTING ALL OVER AGAIN. Hi Mary – As for the right type of mortar, sit tight and keep your fingers crossed. Hopefully it will hold up. As for the color, it would be a shame to repoint and do all that work over again. I don’t know if there is anything that could be done. Try a forum for masons. Wish I could help you. Hi Ken, I Bought a house last year with exterior brick veneer and the mortar is falling apart in some places and there are many cracks along the walls with some cracked bricks. House was built in 1955. Brick seems to have a high sand content, and I’m not certain it is original to the house. There is no glazed face and to me it looks like the cheapest junk brick one could find, but I cannot afford to re-side or have it redone in brick. The brick are standard dimensions and not thin veneer brick. I’m going to attempt to re-point the damaged areas myself. I don’t see any weep holes at the bottom either, which I’m not sure whether or not there should be. Seems like the builder did everything on the cheap. I can salvage the veneer brick from my garage (going to re-side that part) for almost-new matching bricks of the same type. Any advice on mortar type? Thanks for any help. Hi Kyle – For a 1955 brick you are probably ok since the brick is strong. I would contact Lime Works http://limeworks.us/home.php They can advise you better than anyone. Good luck! My house was built in 1993 and there are some bricks with cracks all the way through that need to be replaced especially at a corner. Pintucking is also needed on other bricks. The brick mason came by and I asked the question of what type of mortar would be replacing what was taken out and his reply was “we use Portland”. Is this house old enough to be concerned about the type of mortar replacement; hard or softer than the bricks he replaces and the ones that do not need replaced? Hi – you are safe with Portland. We have had repointing done by an individual we believed to be a competent historic mason, but I could tell on lower elevations that he had used too much Portland. This has been confirmed. Now we are having this mortar removed, but it is a very difficult job. Are there grinding tools that you would recommend for such a difficult job, hopefully something with a wetting element that reduces dust. No keep a blower in it or vacuum(interior) wet the bring and the mortor dust will sick to the brick face. Pretty sweet article. A fountain of information on Tuckpointing. This article is very helpful! We have a cream city brick home built in 1870. The bricks will need tuckpointing in the near future & it will be great to be armed with this information when we are looking for a mason. For now, we are focusing on the limestone foundation which extends about 2 feet from the ground. I am hoping that this is something we can tackle on our own, but I’m not sure how to select a proper mortar. Do you have any suggestions? Also, a neighbor told us that he prepped his foundation by removing all the loose mortar with a power washer (he doesn’t remember the type of mortar he used). Would you recommend this approach? First, thanks for this forum. 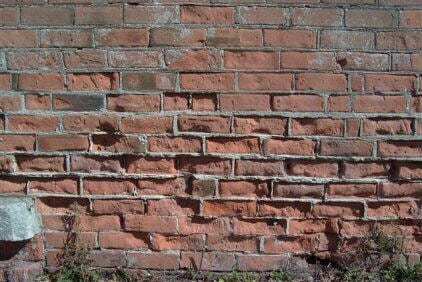 How can you tell if a 100-year old brick wall needs repointing? Our wall looks nice, but the mortar is soft (meaning it can easily be removed with a screwdriver). Is that normal because this is a “soft” old-style mortar, or is this a sign that the mortar has become “too” soft and must be replaced? To my knowledge you will see the mortar missing between the bricks if you need repointing. Best to inquire with a pro in the link listed above. I didn’t know that the hardness of the mortar that I use could damage the bricks. To repoint my house I would have just grabbed the cheapest mortar from the hardware store. So, I really appreciate your heads up. Perhaps this is a job I shouldn’t try to do myself! I want my masonry to last as long as possible. The mason that I hired to repair the mortar on my stone veneer fireplace chimney dug the old vender block out and filled it in with mortar. Is this acceptable. That is what repointing is but the question is what did he fill it with. That is what the usual problem is. There are many types of mortar. We have a home built in 1951 in Chicago. We hired a masonry company to replace the flat garage roof and the first 5 rows of bricks. We thought we were doing it right but I think they used Portland Cement. Now, 3 years later, all the bricks directly below the 5th row are crumbling. The cinderblock inside the garage is crumbling, too. We’d like to sell the house, is there a repair we can do first? I can’t believe we have to throw good money after bad. Is there anything we can do besides replace the brick all the way down the garage wall? I would contact a lawyer. Don’t let them get away with this. We bought our home a year ago. It was built in 1850 in central Virginia. We are only the third owners but the man who bought it from the original family used it as a rental for 30 years, doing only the cheapest repairs possible. The brick foundation and chimneys are covered in many layers of thick red paint. Recently, we have noticed large pieces of paint falling off with layers of brick attached. Is this because of improper mortar? Should the paint be removed? There is mortar coming out everywhere. We do not know who to trust. We want to take care of this house and get it back into the best condition possible. Any guidance would be greatly appreciated! An important step toward a successful repointing job is to secure a qualified and experienced repointing craftsman. An individual who is an excellent mason/bricklayer may not be a good repointer. You did a good job covering some extremely important fundamentals about brick preservastion that most people dont know in this article. I am a proffesional mason and have been dealing with this for many years now. The best solution I have found is to grind out the joints using a grinder. Dewalt makes a cool grinder specificaly for it that comes with a dust collection shroud that you plug a grinder into. I use a six inch sandwich wheel so I can go as deep as possible. Then I wash it out good so the bricks are hydrated. Then I mix 1 part type 1/11 Portland ( lehigh brand is best ) 1/2 lyme and five sand. I’ve done buildings 10 years old and they look fine. Also, recently I was in england and learned there is a difference between hydraulic lyme which is what we have here and hydrated lyme wich works awsomr with old bricks just mixed 1/3 with sand. It does take longer to dry though. I love this blog. Our home build in 1987 needs repointing and at some points, tuckpointing. That is what a busy mason diagnosed. Would it be safe for an oldish house built in 1987 to use Portland cement? What is the difference between repointing and tuckpointing? Also, the mortar in our home is colored. I am thinking that we can paint the whole brick walls with a similar flat color; is it acceptable? Why or why not. (Also a huge problem we have is finding a repointing craftsman, as you advise. We request references of places they have repaired and nobody has provided any). Hi – If your mortar is colored the mason can reproduce that color – no need to paint it. I would think you can use Portland for a newer house. As for your other questions you are best contacting a mason. I really don’t know. I am loving this site. We have a historic home in Western New York that was built in 1840 (!!!). The area where we have exposed the brick is in the kitchen. The wall is 20ft long by 10ft high. We are trying to determine how we’d like to proceed. We are thinking of washing the bricks first, but just based on the above information, would it be smart to remove the old mortar with a chisel and hammer, wash the wall, and then do repointing? Hi – I wouldn’t repoint unless you really need to. Since it’s indoors it should be ok the way it is. It is super sloppy because the wall was covered up with plaster. Since this is the main wall in the kitchen we’d love to make it look like a great feature wall. Hello. Thanks so much for this article. For a house built in 1961 in central Virginia, what type of mortar do you think would work? Is there any other information you can offer on how I can determine what type of mortar is correct? After recent heavy rains, I noticed that the front steps we had relayed a year or so seemed to be an unusual color and looked very saturated. I’d like to ask the contractor what type of mortar he used and I’d appreciate any thoughts on what type of mortar should have been used. Thanks very much. I’m not a mason but you should be ok with a house from 1961. Please refer to the Limeworks link. Thanks so much. I will check out the Limeworks link. We had a mason come to our house today to give us a quote on repairs to the top of our chimney (not the guy who did our steps). He commented that one type of brick on our house – orange in color – is very, very soft. He went over to one of the bricks and scratched on it to show me how soft it is. His son who was with him said that those types of bricks just crumble when they are part of a building that is being demolished. When he said this, I remembered that I needed to ask about mortar. The mason said that he would use “S” mortar. I mentioned your article to him, and he seemed interested and said that he could possible add more sand to the mortar to make it softer. I told him I would send him your article so he could give me his thoughts. I’ll probably ask him to check out the Limeworks link also. Thanks again! Talked to a guy at a local salvage company and explained to him what we have. According to him, our brick is old sand finished brick, and he thinks it was made from 1890 until 1950 (not sure how it wound up on a house built in 1961 unless it was made until the end of the 1950s). So, it seems like we may have brick that needs to have a softer mortar. I’m thinking of type O. Just as an aside, I mentioned my concern about mortar to the guy at the salvage company. He was very dismissive, saying that they wet the brick to keep it from absorbing moisture from the mortar. When I explained to him the issue raised in your article, he basically said, “you’re not going to live to be 200, so you won’t have to worry about it.” That’s not how I do things! But, I definitely appreciate the information he gave me about the bricks. What a bad attitude. Hope he doesn’t get a lot of business. Is it just as important to have the right mortar if it’s an interior wall? Can painted brick exterior be repointed? As stated above – best to call limeworks. our house was built in the 1950’s with common redbrick; our chimney looks as though some of the mortar is gone from between a couple rows of bricks. How do we find out what type of mortar is safe to use on our 1950’s brick? I think you are ok with 1950’s brick but I would contact Limeworks listed in the article. I agree with everyone else on being grateful for information like this. Your other articles have been helpful too. We just bought a 1932 brick facade house in a Seattle and sadly chose the wrong people to start with repointing parts of it. I have two questions, the second is after my ramble. The first is what makes brick no longer durable (my concern is contractors shaving off part of the brick when repointing). Or cracked off corners. I read that brick is softer on the inside and so exposure there could be as bad as missing mortar. So we have cut the job loose as of yesterday and still need to figure out details since we had only paid the deposit. The issue is we just feel more and more that more damage was done than just aesthetic. We thought they would know at least how to match the rake and the color… they didn’t even try. And it’s Type S! They had dust all over after removing part of the old mortar and covered up the brick on some sides with the new gross grey saying the acid wash will take care of that. Anyway… now that it’s rained and we are looking at where we stand, it seems they grinded out parts of the brick too. We couldn’t see this before due to the dust and then the layers of grey mortar shoddily applied. We really went wrong here, someone saying they have 10 years experience still doesn’t mean they repoint old or maybe even new brick properly. I know I should probably consult someone else but would appreciate any unofficial help you can give me. Also what kind of consultant should I be possibly looking for…? Feel free to contact me directly. We’re young and still learning…. The bricks in our foundation are starting to drop orange dust. Is this a mortar issue or simply the bricks are at the end of their life? Who should we be looking for to repair these? A mason educated on historic homes or is it better to start with a structural engineer first? Good question about the dust. I really don’t know. I would contact a mason that knows straight Portland cement is bad. I loved your article … Thank you. now I consider myself a pretty good handy man, and would like to help my son out on his house (built around 1890) from what I’ve researched and your article, I think I can give it a good shot to re-point the basement walls. My question is, type N mortar is rated about 750 psi for strength, and type O is rated at 350 psi, if I combine the two will I have a mortar around 550 psi for strength? example type N =1portland,1lime,6 sand …. type O = 1portland, 2lime, 9 sand …. I am considering using 2 portland, 3lime, 15 sand ! any opinion? Honestly I have no idea. I seriously recommend you contact someone like Lime Works before you do anything. Good luck. I have only a few small (1 inch) gaps where mortar is missing on random places on my house. Is there a kind of premixed mortar than can be pushed in that you would recommend? I am not a mason – I have no idea. Our house was built circa 1860. The brick was local, and has been painted over. Our biggest concern now is the foundation, which I believe is local limestone rock. The exterior needs to be re-pointed. Not sure what was used before but it is either eroded or crumbling. What would you recommend for re-pointing this limestone rock (we wish the rock to show not totally cover it over). Thanks! I have no idea. Best to contact the expert I have listed above.